Effective September 15, 2018, Britannica will no longer offer the World Data Analyst product. 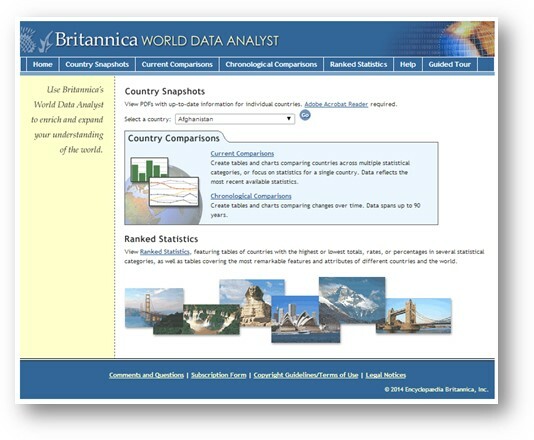 Britannica has decided to end availability of World Data Analyst, the rich collection of current and historical statistics on the countries around the world that allows students to make makes historical and cross-national comparisons quickly and accurately. Due to the rate at which the number of publicly available sites providing similar, high-quality content has increased in recent years, it is at this time that Britannica feels users are better served accessing data sources directly to find the most current world statistics. Sites like World Bank Open Data, the United States Census Bureau, or the CIA World Fact Book were already important sources for World Data Analyst and now offer more current data in user-friendly formats. The discontinuation of this lesser-used database will allow Britannica to put even more of our 250 years of curriculum-building content expertise behind other, more dynamic education products such as ImageQuest and Britannica School, continued expansion of classroom innovations like Britannica LaunchPacks and Britannica School Insights, and bring our customers more thought-leading initiatives such as the October Media Literacy Challenge.